Today I’m sharing my Lime Crime Diamond Dew Glitter Eyeshadows with you. Lime Crime is an indie brand that is 100% cruelty-free and 100% vegan. They are also PETA and Leaping Bunny certified. Lime Crime markets these as eyeshadow toppers, though also says they can be worn on their own. They’re supposed to elevate your eyeshadow game to the next level with the pops of glitter. 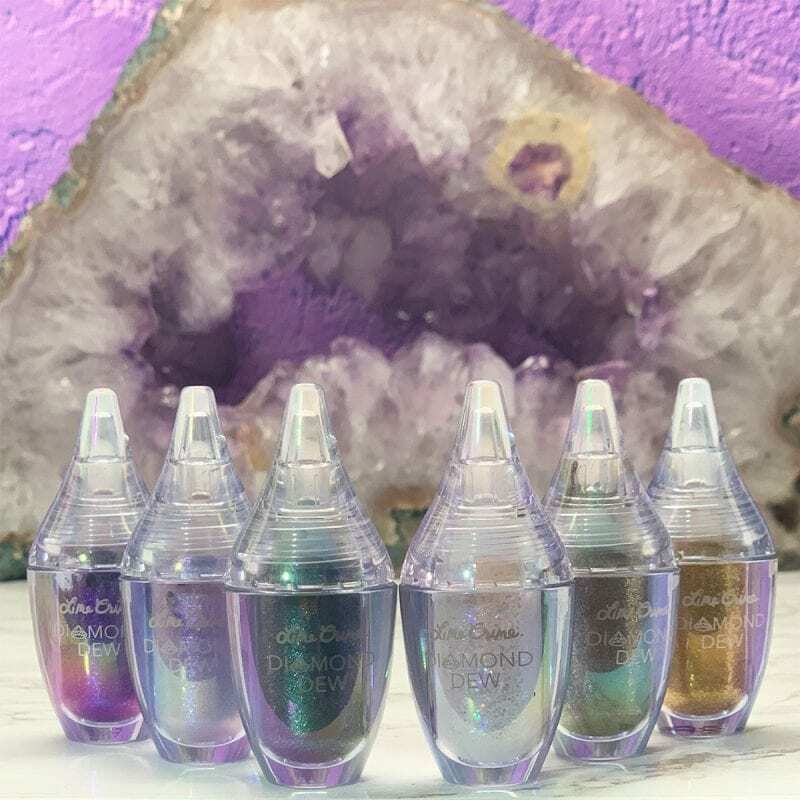 The Diamond Dew Glitter Eyeshadows are waterproof, smudge proof and crease proof, making them perfect for hot humid summers and festival makeup. Confetti – sparkling diamond effect. I wish the glitter in this one was much smaller. I love the colors in it, but the glitter particles are too big for my taste. Dragon – teal copper blue. Dragon is my favorite of all of these. It looks great layered on top of all my teals, blues, and greens. 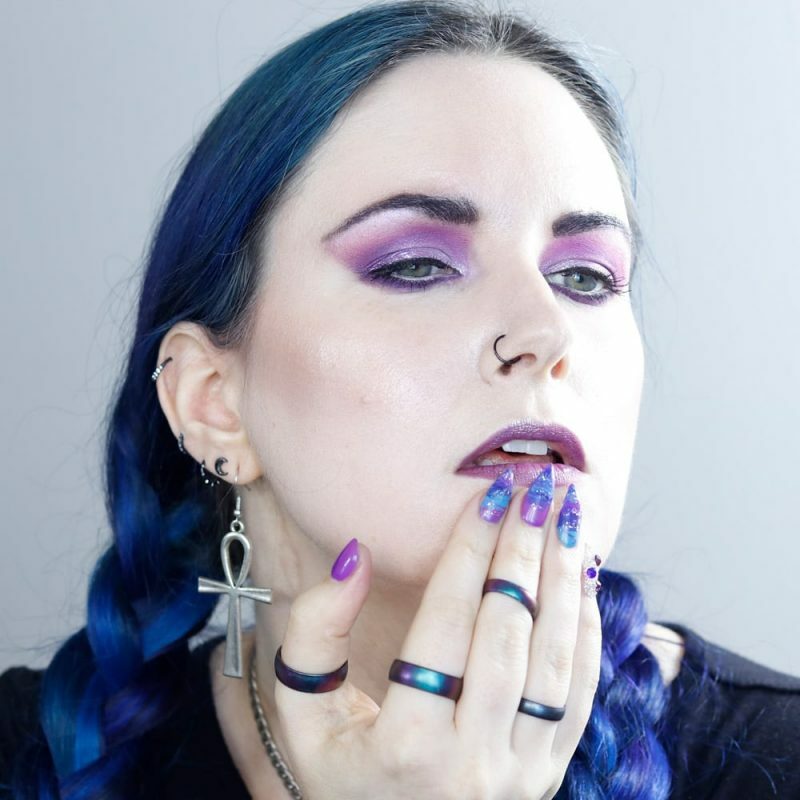 Aurora – grey violet blue. Aurora is a gorgeous glowing lavender with a few larger glitter particles mixed in. I hate the larger glitter particles. Holy Shift – purple with pink and blue iridescence. Holy Shift is one of the most pigmented out of this bunch! I love the rich purple hue, but hate the extra large glitter in it. Magnet – dark pewter. Magnet is a pretty deep silvery pewter with hints of champagne warmth mixed in. Gold Dust – 24k gold. Gold Dust is an over the top, in your face gold. 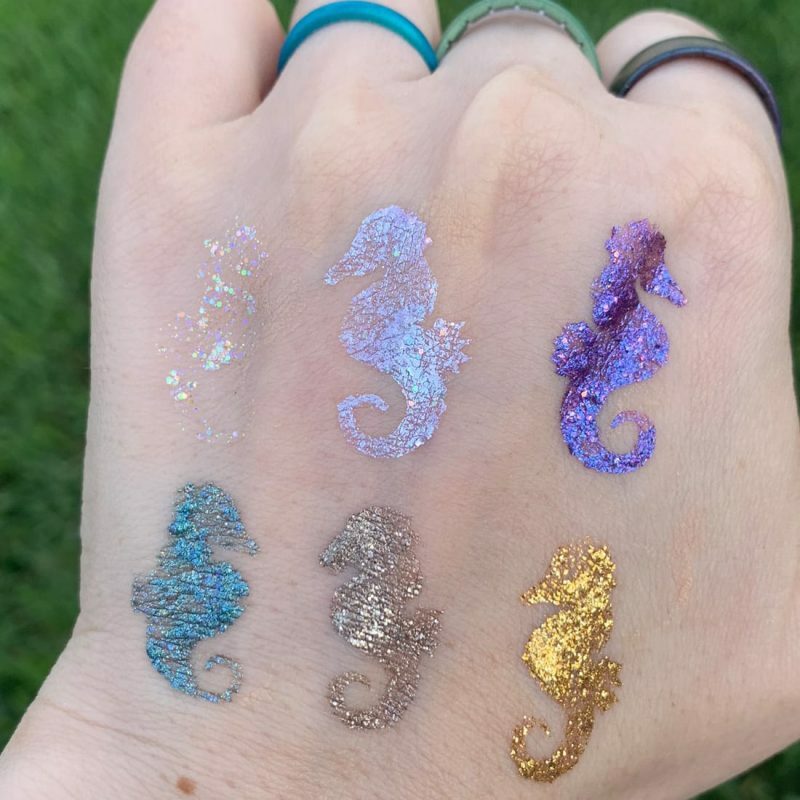 I’m still looking to add Chameleon (iridescent burgundy), Rose Goals (iridescent rose gold), Pixie (pink with green iridescence) and Starlight (iridescent gold and silver) to my collection. Mickey used Confetti Diamond Dew along with Saucebox Etude palette and Lime Crime Venus XL palette to create my look for the Chilling Adventures of Sabrina Lookbook. See all the details on my Sabrina Inspired Makeup look! 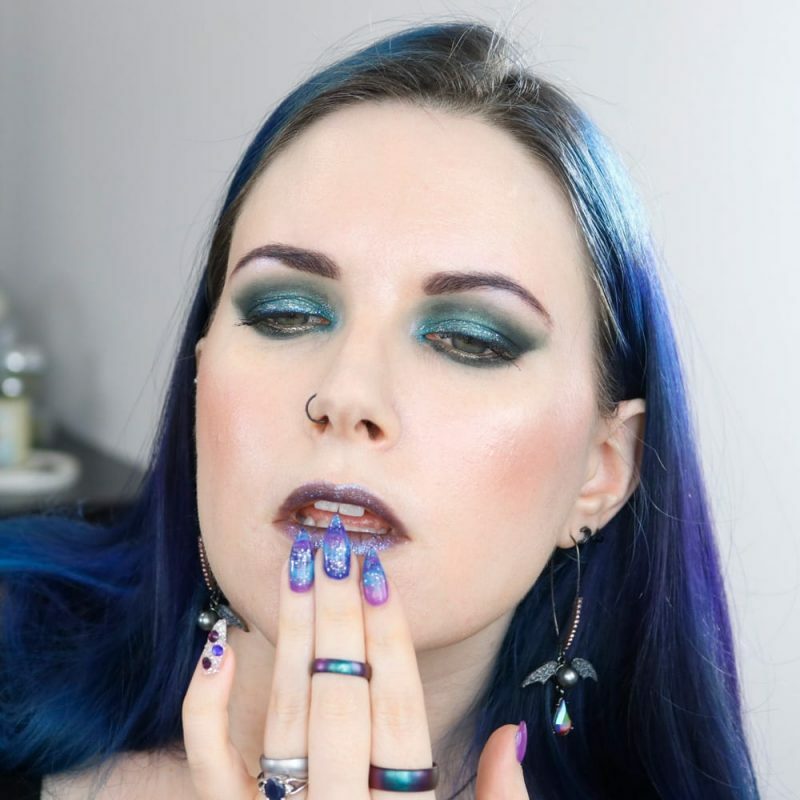 I used the Melt Cosmetics Smoke Sessions Palette (Space Queen) and Saucebox Secret Garden Palette (Meadow) with Lime Crime Dragon to create this blue-green look. 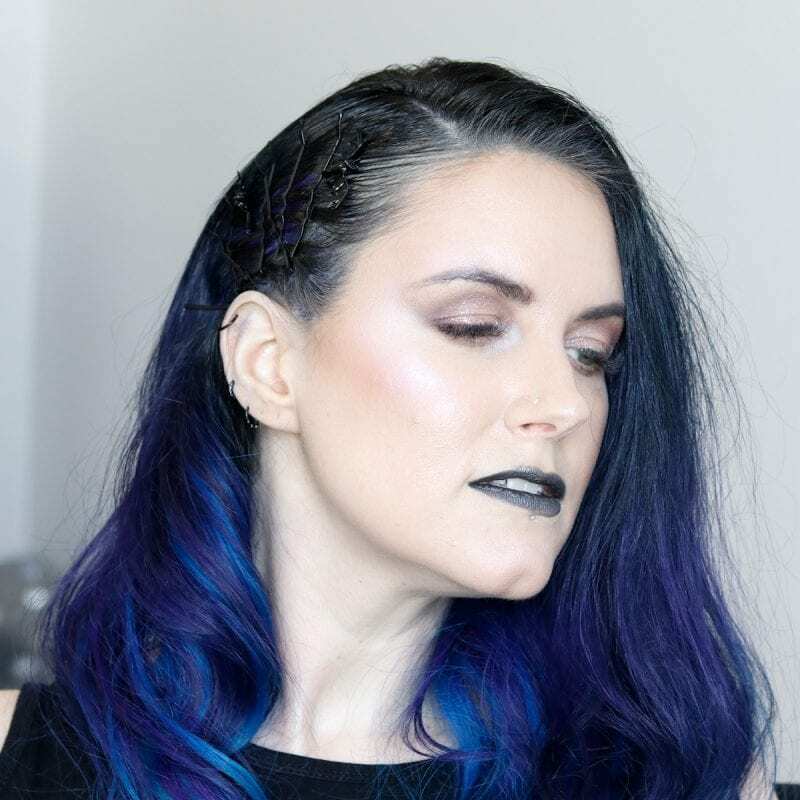 See the details on my Melt Space Queen look! 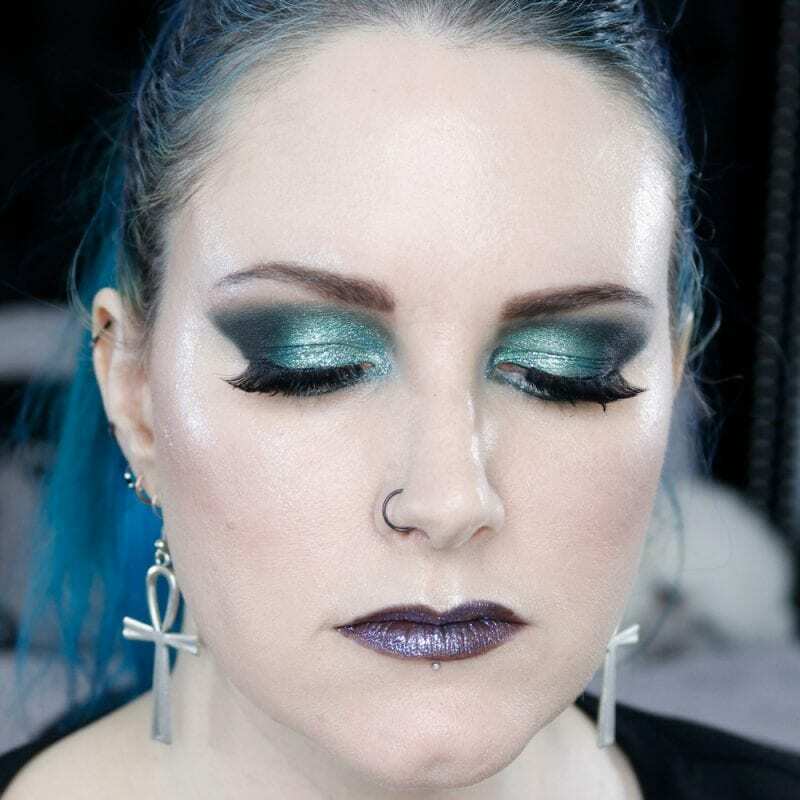 I used the Melt Cosmetics Smoke Sessions Palette with Lime Crime Dragon for this cool green look. 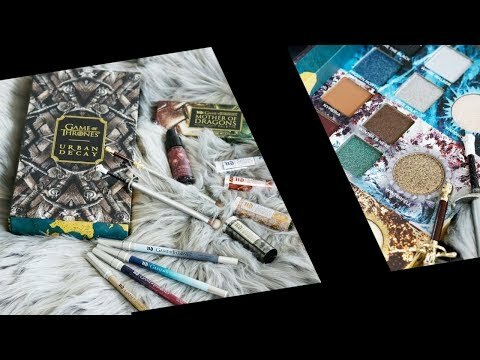 See my Melt Smoke Sessions Tutorial for Hooded Eyes. 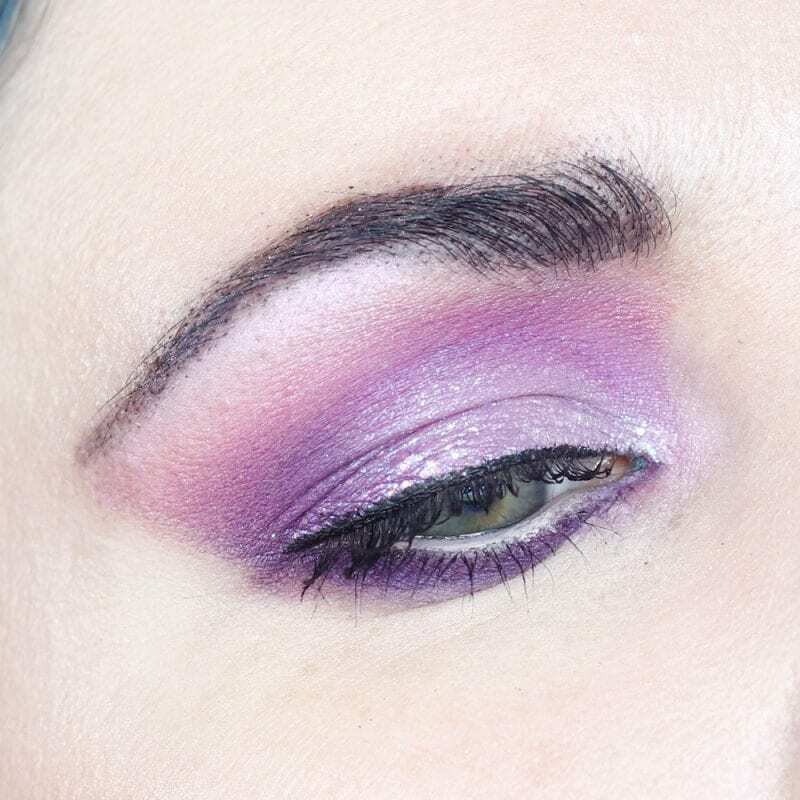 I used the Saucebox Secret Garden Palette and Nocturne Palette, then layered Aurora and Holy Shift on top to make the look pop. 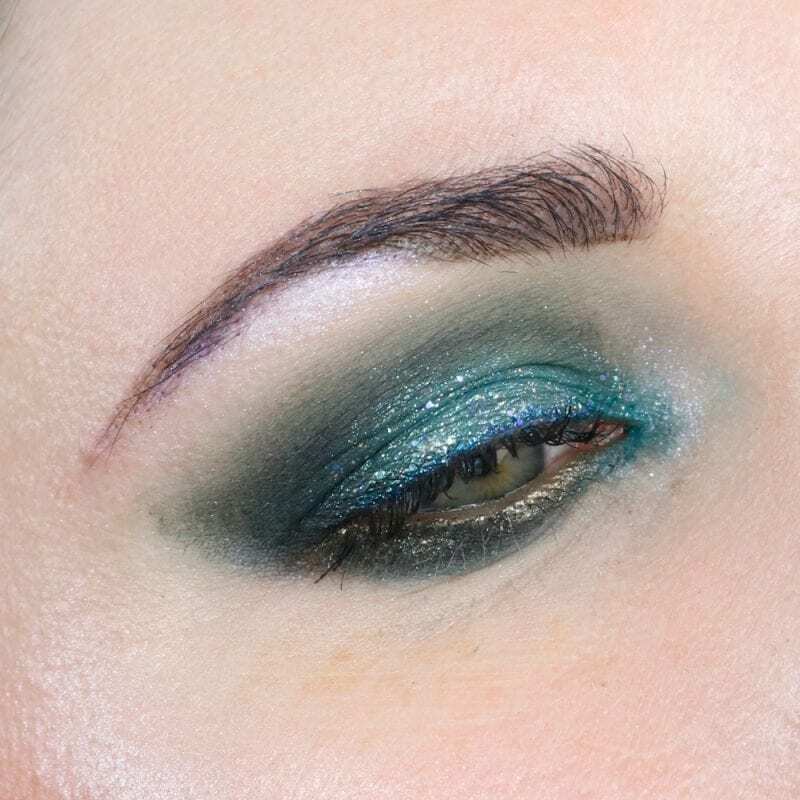 See exactly how I use them in my Saucebox Secret Garden Tutorial for Hooded eyes. My overall opinion on the Lime Crime Diamond Dew Glitter Eyeshadows is that they’re great, I just wish the glitter in them was less chunky, smaller and more refined. These glitter eyeshadows work best when layered on top of other eyeshadows. I don’t wear these by themselves. 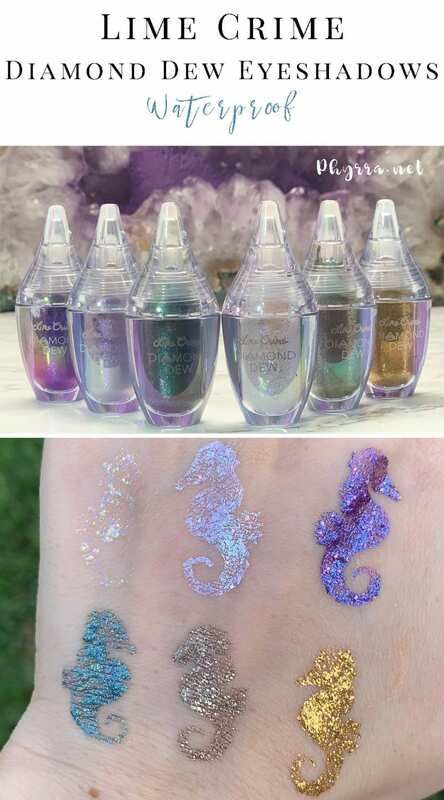 What do you think of the Diamond Dew Glitter Eyeshadows? Not a fan of Lime Crime? Check out my cruelty-free makeup brands list to find over a thousand other cruelty-free beauty brands. Interested in the new Lime Crime Softwear Blushes? I’ve reviewed 5 of the Softwear Blushes here. Want to know my favorite Lime Crime product? It’s the Plushies Soft Focus Matte Liquid Lipsticks. 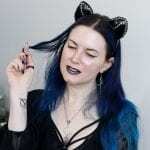 Curious about my first Lime Crime review? It was the Venus III Palette. Love those shades, I don’t do big glitter but they look great on you! What cute packaging. The glitter is too big but the colors are still pretty. Those look fabulous. I only own one item from LC, a lipstick!